Between this and the earlier post on “Fighting and Writing,” The Millions is really digging its knuckle into a bruise today. Since I officially gave up on it two months ago, I’ve contemplated dragging a 700+ page manuscript into the trash folder and burning the only printed copy in the backyard. I’ve never before had the urge to do that with a piece of writing, but I feel like it may be the only way I could ever let it go. For fear of regret I will probably never do it, but damn it would feel good. I read Marilynne Robinson somewhere talking about how, once she had gotten it into her head to journal. At first, she enjoyed it, jotting down these keen insights and pithy observations that popped into her brainpan throughout the day. 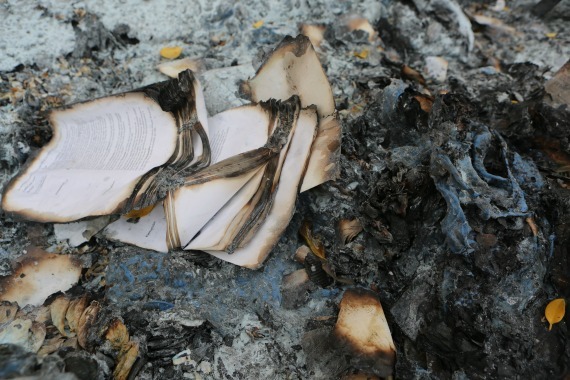 Then, maybe three days later, she went back to look at her scribblings in all their profundity and thought to herself: “Idiot.” I don’t remember if she burned the offending document, I just know she had better sense than to publish it. Facebook should incorporate an “immolate” feature. A good read, Nick, but not even a grudging nod of the head Bulgakov’s way? The man pulled off one of the greatest feat of meta-textuality ever managed. Bulgakov burns his real draft of “Master and Margarita” in the stove, and then rewrites the book from memory, adding bits, like the part where he appears as a writer who lets the Devil know that he’d love to show him his book, but he can’t: he’s gone and burned it in the stove. And we end up seemingly admonished by the idea that “manuscipts don’t burn. At least the really good ones don’t; for the bad, no fire is hot enough. The concept of burning your work is put forth here in a gentle way, treating this subject matter and the world of writers most respectfully. It is a hard grind to be a writer. Thank you Nick for this excellent and thought-provoking piece. Not very eco-friendly by physically burning. Just delete it and be done with it.